Have you ever had an arepa before? I don’t think I had ever heard of one before I visited Hola Arepa!! Now I think about them every day! Hola Arepa was first a food truck and now they have a brick and mortar on 35th and Nicollet in South Minneapolis. I’ve been for dinner and brunch. The first time I went there was soon after my diagnosis. I read reviews before I went for a Tuesday night dinner with my girlfriend and was nervous as it was one of my first dining out experiences with Celiac. We sat down and I did the whole spiel about having Celiac and yada yada. The waitress said, “I have celiac, too! This is one of the few places I can actually work.” Needless to say, I felt safe and relieved! They basically only have one dessert with gluten in it and everything else is safe! Bring on the arepas! Hola specializes in Venezuelan stuffed arepas which are cornmeal patties cooked on a griddle and then stuffed with meats, veggies and cheeses and topped with salsas. Soooooooo good!! The arepas come with a side of delicious fat, hot, squishy yucca fries with either an aioli verde or chimichurri dipping sauce. To die for!! 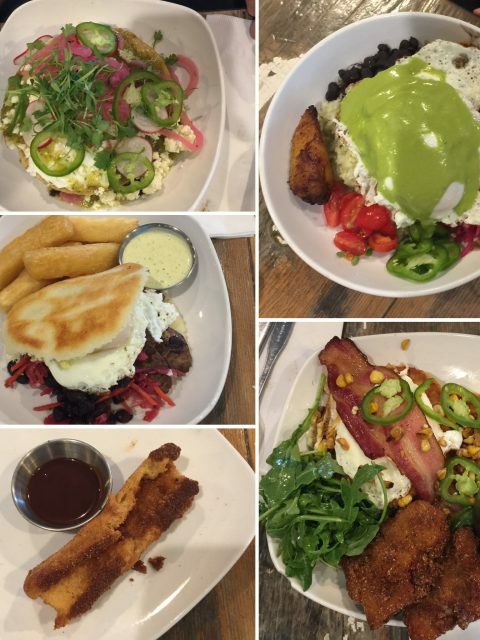 Besides the arepas, they also have a few apps and small plates and an incredible desert menu. They are open for dinner Tuesday – Sunday from 3-11. They also have brunch on Saturday and Sunday from 10 -3. 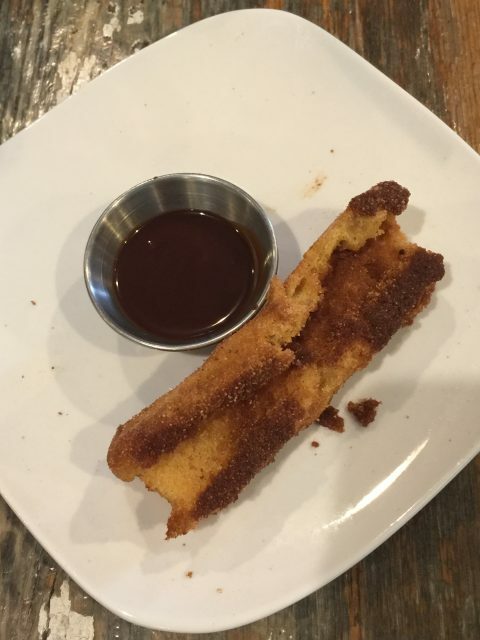 I’ve been twice for brunch and can I just say that they have GLUTEN-FREE CHURROS (yes, I’m screaming) with a warm chocolate dipping sauce! HEAVEN!!!!! I have arrived for brunch both times before they open and there is already a line forming in the parking lot. That is how good their brunch is. 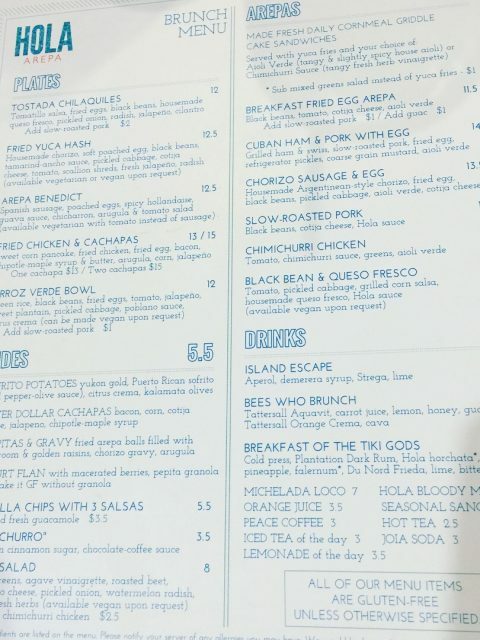 They also have a fried chicken dish on their brunch menu that is gluten-free! Oh, and try their cocktails! All of them! If someone is visiting our city and asks for my recommendation for where to go I always say Hola Arepa as my #1 choice. It is different, unique, fun, tasty, and 99% gluten-free. 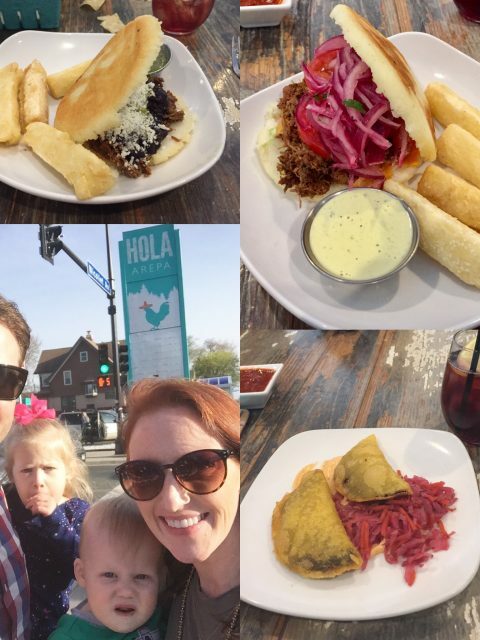 Check out some of the photos from my visits to Hola Arepa!